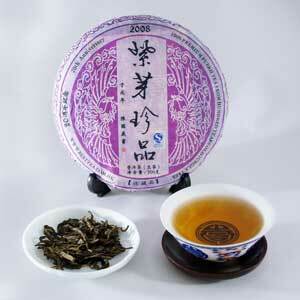 A rare botanical specimen, purple tips can be found only in 20 percent of the wild tea trees. The leaves of this Purple Tip cake were plucked from trees over 500 years old. Made with a bud and two leaves, this tea has a deep malty flavor with a strong lingering aftertaste that is comforting, yet invigorating. Although this is a young cake, it possesses the character and the qi of an older cake. It has all the delicate yet profound nuances in flavor I have been hoping for.